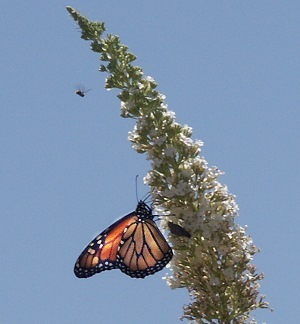 Typical of the Buddleias or Buddlejas, White Profusion Butterfly Bush is a large stately beacon to butterflies and beneficial insects. A good clear white flower that blooms from late spring through late summer. It has soft silvery undersides on its leaves which complement the white of the flowers. 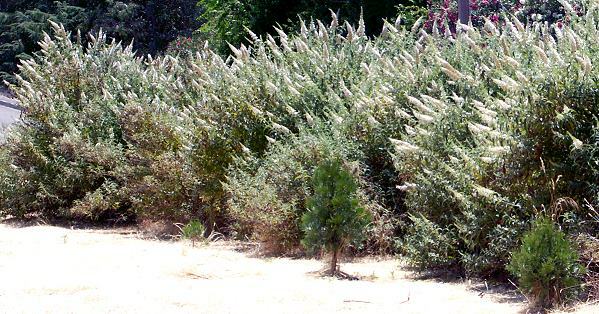 Pictured below is a three year old hedge of White Profusion Butterfly Bush. This is about four plants that we took from three inch pots and transplanted into gallons in early spring. By fall, they were large enough to be moved to this area. The row measures about 30 feet long and 8 feet wide and 6 to 8 feet tall. It is very striking in bloom. This plant is sometimes available in plug trays. These trays hold 128 of all the same plant. They are a great low cost way to fill a lot of space. Each cell is 3/4 of inch by an inch. Check here to see if White Profusion Butterfly Bush Plug Trays are available. White Profusion Butterfly Bush makes a great addition to our Wildlife Herb Garden Six Pack and to our Zone 5-11 or Zone 8-11 Fragrant Herb Garden Six Packs.